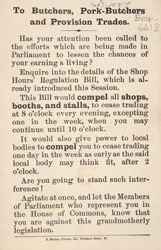 This leaflet was aimed at butchers and associated trades, and is a political pamphlet protesting the Shop Hours Regulation bill. The bill proposed limiting the working hours of children and young people in shops to no more than 74 per week, including meal times. It would also regulate the hours that shops could trade. The bill was enacted into law in 1886.